Oshio Beni is a considered a favorite upright tree among Japanese maple enthusiasts. With a maximum height of 15′ or so it doesn’t grow quite as tall as other upright rights. Spring color is red with a hint of orange but quickly deepen to a deep purple. It holds it color pretty well through the season taking on a little green by the end of summer. But as soon as fall rolls in the leaves turn a strking red and they hold that color all through fall until they drop. Seeds from Oshio Beni tend to produce seedlings with good red color. This tree is happiest in zones 5 through 8 and should be planted in well drained soil that is high in organic matter. This tree is a great choice if you desire that deep red color. I love the big leaves and deep red color. Would love to have one, but I live in the Mojave Desert. The temperature here goes from 118 – 20’s not sure if this plant will survive. Please let me know if this variety will survive or a vanity that looks similar to this one. Arlene, I’m curious what zone your in? I could tell you more if I knew that. Mike, how fast do these trees grow – how old is that shrubby little guy? I picked up a bunch of seeds from several different red-leafed Jap maples last fall, stuck them in snack-bags in the fridge with some damp soil, and am wondering how long I’ll have to wait to get a few NICE-sized multi-trunk trees like this one. I love the structure of the Japs so much more than the various American maples – they look like they came out of a Japanese-style painting. I’m also pondering how well a backyard nursery will do in my yard – it’s full of black walnut trees! I’ve read that maples succumb to the juglone given off by the walnuts. We rent, so I can’t cut them down…..
Becky, the Oshio Beni in the photo is probably about 40 years old. That’s my guess. A good way to test your backyard for a nursery is to grow out those seedlings from your seeds and see how well they do. Will this maple make it in the central valley of California? I think we are area 9. Penelope, I’m not sure, that’s pushing the zones a little. We’ll have an article soon about Japanese Maples for warmer climates. 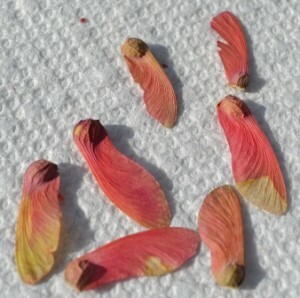 I am waiting for an order of Japanese Maple seeds to arrive from the seed rack, both varieties are weeping, I really want to do some grafting and selling. What are some other sources for seeds and seedlings? I bought a japanese maple in a 15 gallon container. It is 8 ft. tall. I want to plant it in a permanent container. I plan to keep it trimed to 10 ft. What size of container do I need? Diameter & depth. Drainage holes? Does the container need to be somewhat in the ground? I live in zone 7. For each one inch of tree caliper, measured six inches off the ground, you should have at least 18″ of container diameter. But also allow for the tree to grow. In your zone the tree would be just fine in a container, but I really think it would be much happier in the ground. I really want an alternating green and bright red combination like Fireglow or Oshio Beni and Pink Lace but realize they probably won’t be able to take the rooftop climate. I plant this tree close to my house in North Texas and have pruned it to grow straight up. It has been the ground for about 4 years and is about 6ft X 3ft. Get sun till about 4 in the summer. Would like to transplant to a garden area that will have the same conditions but would allow it to spread. Is this possible and if so how would I do it? My two year old Oshio Beni is starting to leave out now that it’s May, but the leaves are very droopy and wilted. It also seems to have some dead twigs on the tips of the branches. I don’t remember the leaves looking like this last spring. Do you know what the cause could be? Probably fine, new leaves that haven’t full opened can look like that. Cool weather will keep them looking that way for a while. Dead twigs are normal. Why the leaves of my oshio beni Japanese maple trees which used to be red , are now green? Does the color change with the seasons of the year? They do lose some color in the summer. And of course the more shaded they are the more green they are. I love the Japanese maple trees but we live in zone 9-10. We get a little coastal humidity at times. Is there a tree, of the smaller version ( max. 20-25′ ), that may survive in our zone? It would get morning and mid day sun.